How to become a model train pro? Nowadays you can walk into any model railway shop or supermarket and buy a starter set by any manufacturer, unpack the box at home, start assembling the single parts and off you go. Prices range from 50 Euro up. 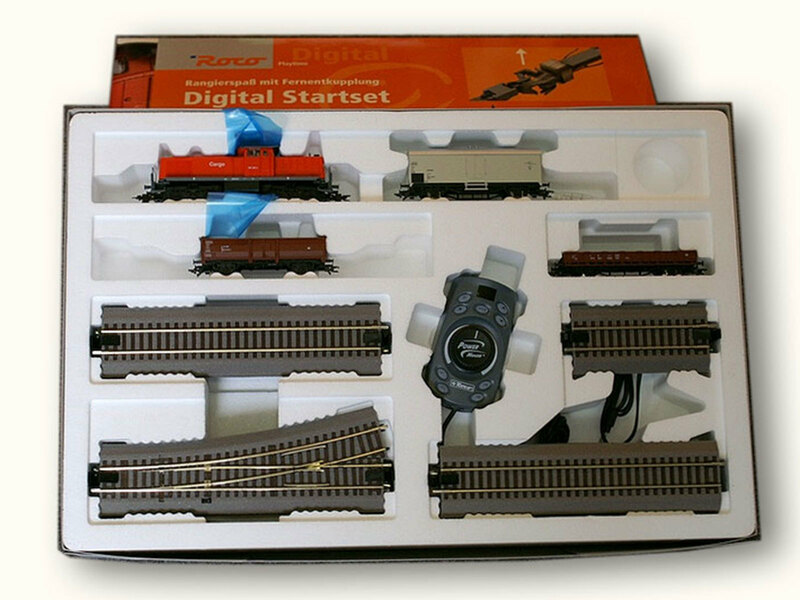 These simple sets normally contain a train, a track oval or circle, and the necessary power supply (transformer, electronic stabilizer for instance). Absolutely anyone can do it without prior knowledge. Even expanding the set with complementary sets, individual parts and rolling material doesn’t pose a major problem. However, if your interest in model trains is somewhat deeper or you used to have your own set and are now looking to re-enter the subject, you are probably contemplating the subject beforehand to make sure not to waste money on unnecessary investments. These thoughts beforehand will save you money in the long run. Admittedly the model train industry is currently going through a complicated phase; no one can predict the development of one or the other manufacturer or system in the distant future. Upon starting out on your personal model train career, it can be hard to foresee your core area or whether you will be running your trainset or keeping it in a display or a box. It is impossible to tell in the beginning, so we won’t pay much attention to that right now. The two most important questions for any model train set hobbyist are the questions of space, and in direct correlation to that the gauge, and the question of budget. Once these are answered you can think about analog or digital controls or the “right system” should you have chosen gauge H0. If you know from the start, that you don’t want to build a model railway but simply collect, then your main concern for space is organizational, where to put the display and how large it should be. In most cases the question of space is representative for the choice of gauge. As a rule of thumb one can say that choosing a smaller scale will give more layout content per square meter. If I choose to stay within a small layout with many details, like for instance a diorama, I can also use a larger scale. In Germany the most dominant gauge is gauge H0 (scale 1:87). 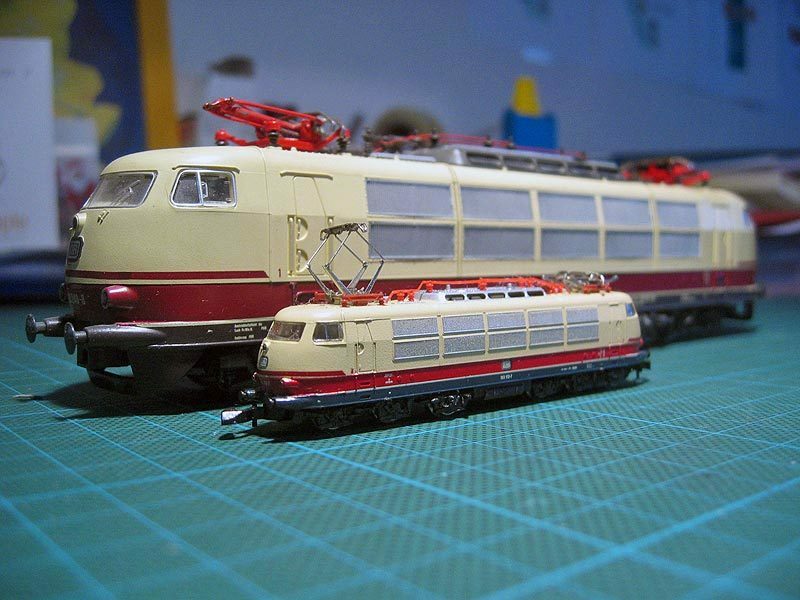 In this scale you will find the most rolling material (engines, coaches, motor coaches). There are two competing systems in this scale, which unfortunately are not compatible with each other, but more on that for later. The second most common gauge is gauge N (scale 1:160). It also provides a large assortment and the models are easy to handle. Many people prefer gaugeN for its smaller scale and the possibilities to fit more into less space. This is why this gauge is very popular in Japan. In between these two scales we find gauge TT (scale 1:120). Partly due to history it is widely popular in the Eastern part of Germany. The variety is not very large and often can’t be purchased in Western Germany, because merchants don’t hold it in stock. In the recent past the so called garden train has become very successful even though the manufacturer, LGB, underwent severe financial problems. This gauge is often called gauge G, but that is not an official name. Basically it is a narrow gauge in a scale of 1:22,5. This is emphasized by the amount of rolling material provided. An advantage of this train is, that it can be operated in- and outdoors. Last but not least there is gauge Z (scale 1:220) which enables elaborate displays in small spaces, but has a very restricted range of models. If you are interested in rolling trains over longer naturalistic distances you might still choose this gauge and build natural looking landscapes in your attic. For some of these scales you can buy models, rails and components in narrow gauge. The Gauge name will be supplemented with an additional m (meter gauge), e (750 mm gauge) or f (Feldbahn/light railway). Model narrow gauge railways or modle cable cars have a charm of their own and there are starter sets by several manufacturers. For most model railway enthusiasts though, they are simply an addition to normal gauge railways. If you would like to build in a generous scale and drive in large displays but only have restricted building space at home, you should consider modules. The have module crossovers which make for smooth connections when you meet with others in combination, for instance Nordmodul and FREMO. Every hobby can be pursued to extremes, given a limitless budget as we know. But since this is seldom the case it’s smart to plan your investments first. One affordable entry into the world of model railways are the starter sets as mentioned above. The most affordable gauge for building model is H0, since there are so many manufacturers on the market effecting in lower prices. Still not everything is affordable; there are rare pieces which are priceless- be it due to their age or their hand crafted precision. It is up to you to decide if you rather owned a substantially large collection or fewer pieces in an elegant setting. Apart from the variety of models and the lower prices in gauge H0, the costs for models of all the other gauges are relatively the same. Don’t forget, that an elaborately decorated landscape in garden size will be much more expansive than its equal in H0 or N.
Also please keep in mind, that is has become much easier to purchase models and accessories on platforms like for instance eBay. Regardless of buying new or used material, if you are patient and lucky you may save some money! If you think about joining the model train society today, you should decide about doing it with an analogue or a digital controller. Even if the analogue is not so trendy any-more, it doesn’t mean that you should go straight to the digital. The advantages of dig-ital controls are a relatively easy to handle design. There also is the possibility of easy multi-train control, as well as any special features of current locomotives, which can only be accessed digitally. For owners of older models, building with analog technology can be worthwhile if you do not want to retrofit your locomotives- alt-hough this is generally also an option. I can’t recommend retrofitting from analog to digital, to be honest. If you are interested in using in modules, please check first with possible teams or meetings to make sure whether they are using digital or analog systems. Of course analog model trains have their advantages as well: They are far easier to repair (which can be done by the owner in most cases) and repair is much cheaper because it is easier to spot the failure in analog than in digital systems. Fur-thermore, the incorporation of self-built electrical parts (for example, limited railroad crossing) into an analog system is not as complex as into a digital system. Another bonus of the analog is that you can use both purely analog, as well as digital rolling material. Should you now decide for a digital system, you should consider that, regarding the model building, one cannot use older rolling material (because there was no digital available at the time).